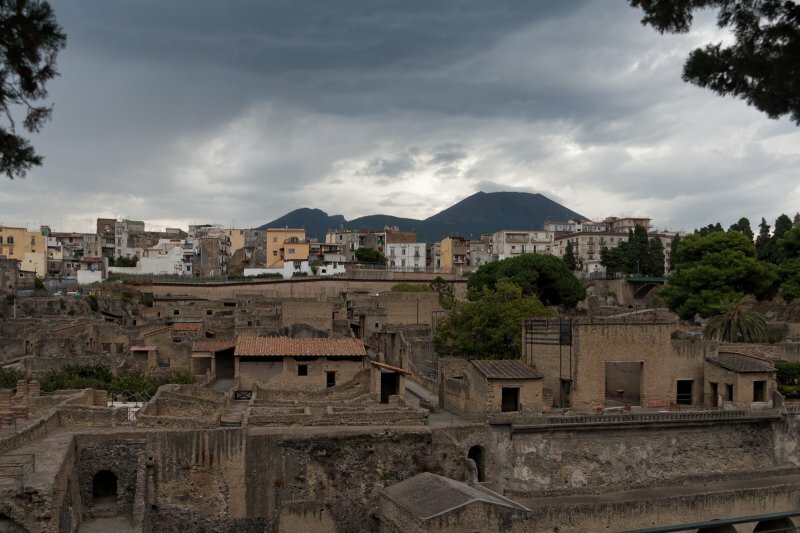 After the eruption of Mount Vesuvius in 79 AD, the town of Herculaneum was buried under approximately 20 meters of mud and ash. It lay hidden and nearly intact for more than 1600 years until it was accidentally discovered by some workers digging a well in 1709. From there, the excavation process began but is still incomplete. Today, the Italian towns of Ercolano and Portici lie on the approximate site of Herculaneum. in the background: Mt. Vesuvius (Italian: Monte Vesuvio) and the buildings of modern Ercolano.